At the North American International Auto Show, Chrysler shocked media by unveiling their new minivan – the Chrysler Pacifica. While families everywhere get excited about new minivans, what really excited was that the Pacifica will come in a Hybrid version with a plug! The 2017 Chrysler Pacifica Hybrid minivan has an estimated 248 horsepower, and can drive up to 30 miles on electric power from its 16 kWh lithium-ion battery pack. City efficiency is rated around 80 MPGe, and a full charge will take about 2 hours with a level 2 charger. The Pacifica Hybrid will be the industry’s first electrified minivan. Although the second row of stow-and-go seats had to go because of the battery pack, the 3rd row still has stow-n-go capabilities and makes the Pacifica Hybrid able to sit up to 8 people. Chrysler didn’t make any announcements about pricing, but the battery pack is large enough to qualify for the full $7,500 federal tax rebate in the USA. “The all-new 2017 Chrysler Pacifica is truly a no-compromises minivan, giving customers everything they need or want,” said Timothy Kuniskis, Head of Passenger Car Brands, FCA – North America. 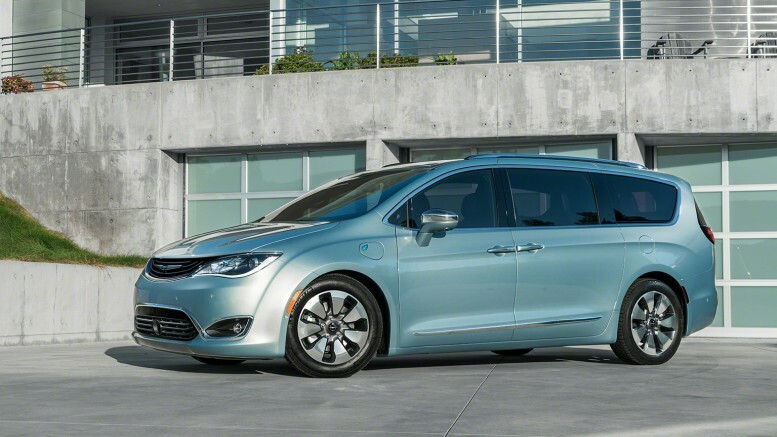 1 Comment on "Chrysler Pacific Hybrid Plug-in Minivan with 30 miles electric range coming later this year"
I’ve heard this charging claim elsewhere, and it still doesn’t make sense. Replenishing a 16kWh battery from a 6.6kW charger is going to take at least 2.5 hours. One could argue that’s “about” two hours – but it’s closer to “about” three.